Lock in a great price for AmiCe B&B – rated 8.1 by recent guests! The breakfast was great, we could even make eggs. Sarah - 1 of our hosts- was really nice. It is a great experience to try this type of accomodation. The location is perfect to stay if you want to know Amsterdam and want to take a break, Zaandam is a beautiful place and near to Zaanse Schans, a must place to visit! 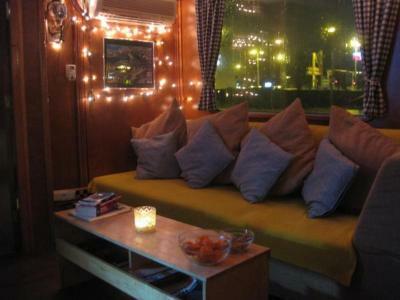 Great experience sleeping on a boat and although the cabin is small and basic it did the trick and was fun! We knew what we were going into as shows it well in the pictures and the boat was lovely and so easy to get into Amsterdam by train via the station just 10 minutes walk away through a lovely town. Great Argentinian restaurant in town too to eat at! Clean and comfortable. View on the water is wonderful. Everything is ok for the little space. The location area zaandam was fantastic, the owners were so accommodating and friendly and the whole experience was relaxed and a pleasure to stay on this boat. The boat is so cute, the hosts so friendly, the breakfast so delicious! Offering a terrace and free WiFi, AmiCe B&B has accommodations in Nijmegen. Holland Casino Nijmegen is 2 miles from the bed and breakfast. The nearest airport is Eindhoven Airport, 44 miles from the property. When would you like to stay at AmiCe B&B? House Rules AmiCe B&B takes special requests – add in the next step! Please inform AmiCe B&B of your expected arrival time in advance. You can use the Special Requests box when booking, or contact the property directly using the contact details in your confirmation. Beds/bedrooms , were very cramped for a tall visitor like myself. A bit tricky taking a shower but not too much a problem, I’m short so the 2 mirrors in the room were too high for me to hairdry my hair and apply makeup. 14 Russian men were having a rowdy alcohol-and-drug party on the deck, harassing and intimating new-coming guests and blocking the entrance to the cabin when we arrived. The hotel staff was nowhere to be seen. After we called the hotel owner intervened. The staffer took it out on a small, non-European woman who was in our group. During our stay we were totally indifferent to the cramped and humid rooms or the uninsulated cabin walls because we were overtaken by all the happenings which resembled a scene in a thriller. Neither the owner nor staffer gave any apologies or assurance. I am giving Holland B&B a -5/10 . I never gave negative reviews but our stay was pure hell.